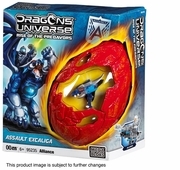 Product Detail Summary: From the Exgeneron species, Assault Excaliga is a large Master-class Dragon that specializes in weaponry and brute force to demolish his opponents. He has bonded with his Dragon Rider, Photius, to increase his strength and abilities! Members of the Alliance faction, they are fighting to end the war for the Power Cores, the world's primary source of energy.